Life could always be more organized. Whether you're in the classroom, office, lab, or at home, our shelving, storage, and organization units will help you get a handle on all of your equipment. If you need mobility, we have a large collection of carts. If you need wall storage or shelving, there is plenty to choose from. Literature Display Racks for pamphlets and books are great for tight spaces and waiting areas. Bookcases pack tons of storage space for all your needs. There's a bookcase for however many books you own. Cubbies and Lockers are available to keep personal items separate and safe. A variety of wooden or metal, locking or open, lockers and cubbies are available to choose from based on the location of where they'll be going. Lab Shelving and Vocational Storage options fit the more specific needs when you already know what you'll be shelving. Tools have a place to hang and chemicals will have a safe home. Hanging safety equipment is no longer an issue, with customized storage for gear. 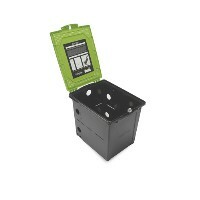 Filing and storing important documents is now convenient and simple. Storing binders and reference materials no longer has to be difficult to go through, and it will no longer be an eyesore, when you have a Binder Carousel. 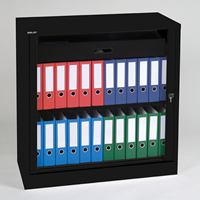 Locking spaces for the binders keep important files safe. Rotating Carousels make it easy to access files as quickly as possible.